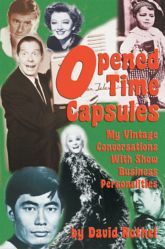 From the 1970s through 2003, author David Rothel interviewed dozens of show business personalities. Here's your chance to eavesdrop on the conversations of such stars as Myrna Loy, Vincent Price, Milton Berle, and more. Twenty celebrities recollect their career highs and lows in this fascinating oral history of American popular culture. For anyone with an avid interest in the history of that bygone, golden era, avid Rothel's fascinating conversations with these show business personalities will bring back many fond memories.